Lord Kelvin, the famous British scientist who accurately calculated the temperature of absolute-zero, is credited with the saying, “To measure is to know.” Others cite the old business adage, “You can’t manage what you can’t measure.” The point is that it is impossible to know how well your building is performing unless you can measure its energy use and compare it against a meaningful baseline. Energy benchmarking is a common practice, and is required in, two states, one county, and fourteen cities across the United States. Benchmarking can be as simple as comparing this year’s energy bills to last year’s; however, in order to truly understand how your property is operating, you must go further and benchmark more broadly, accounting for fluctuations in weather, the use of your building, which types and how many tenants you have, and other metrics that may influence the energy use of your property. This section will explain some of the most common energy benchmarking tools, and how you can implement them in your own property to measure your energy use and ultimately decrease the amount of wasted energy in your building. The most commonly used benchmarking tool is the U.S. Environmental Protection Agency’s ENERGY STAR Portfolio Manager. Portfolio Manager is an easy-to-use tool that gives your building a 0-100 score, depending on how it compares to an average building. If your building uses an average amount of electricity for its type (e.g., office building, bank, hospital, parking garage, retail, etc. ), then it would receive an ENERGY STAR score of 50. If your building is in the top quartile, it would receive a 75 score or higher, and if it is in the bottom quartile it would receive a 25 score or lower. Buildings that achieve higher than a 75 score are eligible for ENERGY STAR certification. ASHRAE’s Building Energy Quotient rating and labeling system is an advanced energy benchmarking tool for new and existing buildings that benchmarks your facility on a scale based on zero net energy use. Two separate ratings – “As Designed” and “In Operation” – allow the assessment of new and existing buildings, respectively. The bEQ system benchmarks your property against a zero net energy facility, that is, a building that produces as much energy from renewable resources as it consumes on an annual basis. 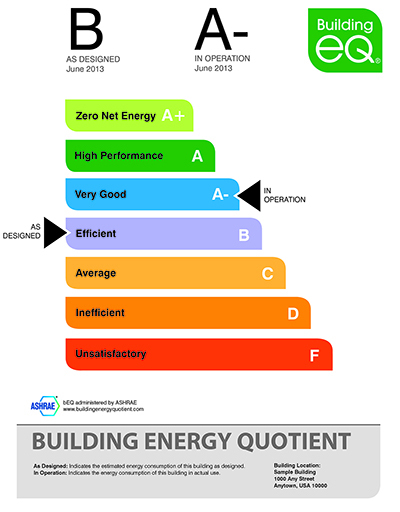 A zero net energy building receives the highest score of 0 and a grade of A+. An average building receives a score of 100 and a grade of C (see Figure 1). The first step in pursuing an ASHRAE bEQ rating is to find a certified building modeler (for new buildings) or assessor (for existing buildings). 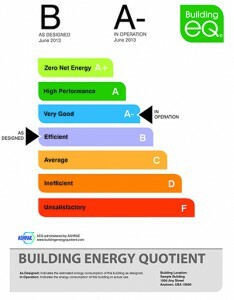 For more information on getting started with ASHRAE bEQ, visit the bEQ website at www.buildingenergyquotient.org. There are dozens of tools you can use to benchmark your whole building, or even just a specific building system. Some are simple, like the ARCH tool developed by the Lawrence Berkeley National Laboratory, which allows you to simply select your building type, enter your annual energy usage, and compare your building to others within the Commercial Buildings Energy Consumption survey (CBECS) database. Others are more complex and comprehensive, such as the EnergyIQ tool that will help you identify energy-saving opportunities. For a list of benchmarking tools, visit the Lawrence Berkeley National Laboratory’s Energy Benchmarking Portal.